For centuries the gamelan beleganjur percussion orchestra has been an indispensable part of political, social, and spiritual life on the island of Bali. Traditionally associated with warfare and rituals for the dead, the music has recently given rise to an exciting new musical style featured in contests that are attended by thousands. Ethnomusicologist Michael Bakan draws us into these intensely competitive events, in which political corruption, conflicting notions of identity, and irrepressible creativity rupture the smooth surface of cultural order. 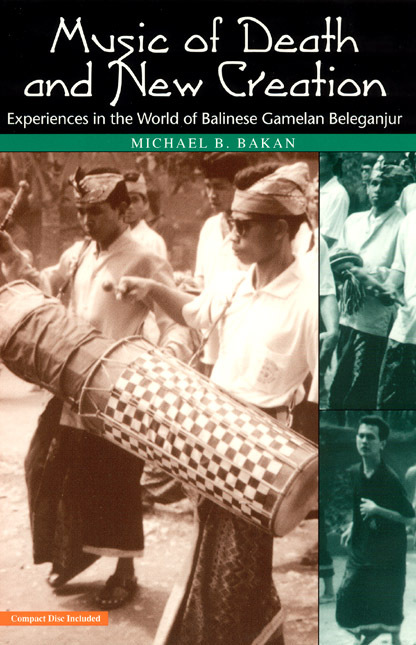 Building from his own experiences as a beleganjur drummer, Bakan also takes us inside a distant musical world and into the lives of musicians connecting across vast cultural divides. Rich with musical examples, photographs, and an accompanying compact disc, Music of Death and New Creation is an unprecedented exploration of how music embodies and shapes life in contemporary Indonesia and beyond.